The debt ceiling ‘debate’ (although debacle seems more appropriate) has spurred many to trumpet the importance of cutting all spending, regardless of what that spending is on. Surprisingly, rather than focus on the most wasteful and senseless spending—fighting at least three wars which are resounding multi-year and multi-administration failures (e.g., Afghanistan, Iraq and the War on Drugs)—most of the discussion has focused on slashing the limited social protections we have in the US system. 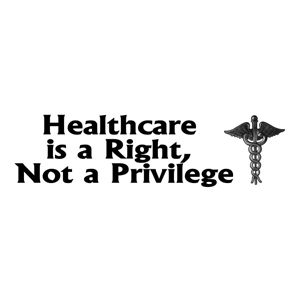 I’ve long been a supporter of healthcare reform in the US and worked as an activist in the early 1990s to drum up awareness of the push for a national healthcare system for all Americans at a time when it was only just gaining momentum. It surprises me still how vehemently against a national healthcare system most Americans are even though they have witnessed decreasing coverage from their policies and exponential increases in their premiums and co-payments. We in the United States spend more than any other country on healthcare per captia by quite some margin. As of 2008, estimates by the Organisation for Economic Co-operation and Development (OECD) found that, after adjustments for currency and purchasing power parity, the US spent on average US$7538 per capita on healthcare. Compare that to the next highest level of spending per capita, found in Norway, at US$5003. Despite this spending, the US is just about equal to Cuba in terms of adult life expectancy (78.3 years overall for both countries). Yet, in Cuba, a mere US$260 per capita was spent in 2005 to the US$6543 spent in the US that same year. Meanwhile, most Americans have experienced the dreaded pre-existing condition clause. That is, those individuals unfortunate enough to have been diagnosed with any sort of pre-existing condition are left without any coverage at all. I personally know more than a few individuals who will never be able to pay off the debt they owe for hospitalisations and/or treatment that potentially saved their lives. One friend has been an insulin-dependent diabetic since he was a child. He could not get insurance of any kind and rarely sought care because it was so expensive. As a consequence, he had a massive stroke at 29, experienced a prolonged hospitalisation and physical therapy, and now cannot ever hope to buy his own property given his credit rating due to the unpaid medical bills. He’s hardworking and always has been, and has even set up payment plans with all of the various providers for his stroke treatment. But, he will never enjoy the luxury of private insurance coverage. I also know many (including myself) who have at one point in their lives gone without treatment even for minor conditions because they either could not afford insurance coverage or could not afford the co-payment. This in a country which until recently has enjoyed unheralded wealth and one which boasts the best possible care available anywhere on the planet. That is, as long as you can afford it. Contrast this to where I currently live—Finland. A friend of mine has the misfortune of experiencing breast cancer. She is a model of dignity and grace and bravery. It’s been a whirlwind for her and for those of us who hope to provide whatever support she and her family need to get through it. One of the eye-opening aspects of it all has been the exceptional (and incredibly timely) care she has received since her first appointment to check out a lump she found. ‘I paid €27.40 for my mastectomy surgery and another €27.40 for my overnight stay in the hospital! My breast prosthesis, a special prosthetic bra and my hair prosthesis (wig) were all covered. Contrast this to the experience of a friend hers who is in the US and also going through breast cancer. The day after her reconstructive surgery, her insurance company sent her a letter saying they would not pay for it. The day after. Can you imagine? My friend here has not had to wait ridiculous amounts of time and has received exceptional treatment as well. It’s really quite impressive. And, as difficult of a time this is for her and her family, the experience has been somewhat less stressful because she is here and not in the US. I know the tired arguments in the US against a national healthcare system which suggest that quality is compromised. That is patently untrue. Finland has one of the highest survival rates and treatment success rates in the world for several types of cancer. Beyond cancer, remember when David Beckham injured his Achilles’s tendon? He came to Turku, Finland, to see a particularly brilliant orthopaedic surgeon to have the tendon repaired . I also know that many Americans baulk at the thought of their taxes being increased to pay for a national healthcare system. I don’t pay anymore in taxes here in Finland than I did in the US, and our quality of life is much better. Frankly, I’d rather my tax dollars went towards things such as improving the US education system and ensuring that healthcare was more equitable and not simply a luxury afforded by those who make enough money. Healthcare costs have been increasing for decades and will only continue to do so, largely due to the insurance industry’s stranglehold over hospitals, clinics and providers. Furthermore, we can still have private insurance and care alongside a national system, much as they do in places such as the UK and the Netherlands. But, isn’t ensuring that all Americans have access to preventative as well as life-saving treatment and care regardless of their social, economic or political background a much better way to spend our tax revenue? Is it not more equitable and just? Would you not want to have that care for yourself or a loved one should you have an illness? ← Things that make you go, ‘hmmm’…. I hope there will be a time on this planet when humans will feel ashamed they once sold health care like a bag of tomatoes in the marketplace. Place that next to war and slavery. But I’m not optimistic. Most likely we will destroy our habitat and disappear before we have progressed far enough from the cycle of kill-or-be-killed in all its social manifestations.